Melanie Ilic och Dalia Leinarte. 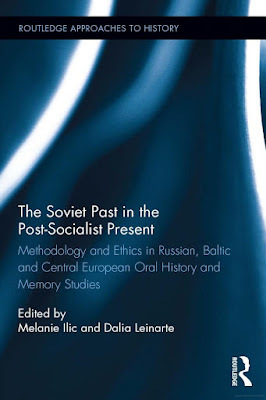 Soviet Past in the Post-Socialist Present: Methodology and Ethics in Russian, Baltic and Central European Oral History and Memory Studies. Routledge, 2015. Melanie Ilic is Professor of Soviet History at the University of Gloucestershire, and Honorary Research Fellow at the Centre for European and Eurasian Studies, The University of Birmingham, UK. Dalia Leinarte is Professor of History and Director of the Gender Studies Centre at Vilnius University, Lithuania, and Fellow Commoner at Lucy Cavendish College, University of Cambridge, UK. This collection examines practical and ethical issues inherent in the application of oral history and memory studies to research about the Soviet Union and Eastern Europe since the collapse of the Soviet bloc. Case studies highlight the importance of ethical good practice, including the reflexive interrogation of the interviewer and researcher, and aspects of gender and national identity. Researchers use oral history to analyze present-day recollections of the Soviet past, thereby extending our understanding beyond archival records, official rhetoric and popular mythology. Oral history explores individual life stories, but this has sometimes resulted in rather incomplete, incoherent, inconsistent or illogical narratives. Oral history, therefore, presents the researcher with a number of methodological and ethical dilemmas, including the interpretation of ”silence” in biographical accounts. This collection links the discussion of oral history ethics with that of memory studies. Memories are shaped by factors that may be, simultaneously, both consecutive and disrupted. In written accounts and responses to interview questions, respondents sometimes display nostalgia for the Soviet past, or, conversely, may seek to de-mythologize the realities of Soviet rule. Case studies explore what to do when interview subjects and memoirists consciously, sub-consciously or unconsciously ”forget” aspects of their own past, or themselves seek to take control of the research process. Maija Runcis (Stockholm universitet) med kapitlet ”Recycling Archival Sources and Oral History: The Nationalization of Private Housing in Soviet Latvia”. Kapitlet handlar om sovjetisk boendepolitik och återanvändning av berättelser insamlade bland hyresgästerna i ett hus i Riga. Yulia Gradskova (Södertörns högskola) med kapitlet ”Women’s Everyday Life in Soviet Russia: Collecting Stories, Dealing with Silences and Exploring Nostalgia”. Detta kapitel diskuterar problem kring insamling och analys av muntliga berättelser om moderskap och skönhet i Ryssland under Sovjettiden. Ildiko Asztalos Morell (Uppsala universitet) med kapitlet ”Self-Sacrificing Motherhood: Reconsiling Traumatic Life Experiences of Hungarian Collectivization”. Kapitlet diskuterar moderskap under kollektivisering utifrån två berättelser samt etiska problem med att intervjua om traumatiska erfarenheter.